Discussion in 'Contrails and Chemtrails' started by Mick West, Aug 17, 2013. 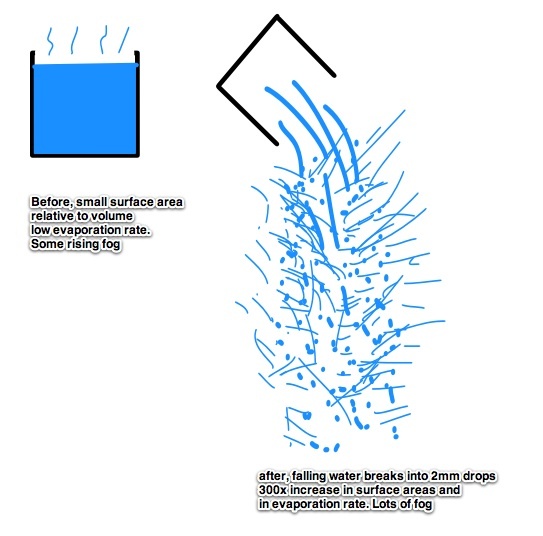 Here is an image showing how falling drops of water will break up into drops smaller than 5mm at terminal velocity. The 2mm figure I use is an average of this. There's also the possibility of some very small drops freezing solid - or even instantly freezing on the surface, then rapidly breaking up. It would make some interesting high-speed camera footage if you could drop the camera along with the water. However, I suspect the majority of the effect comes from the evaporation/condensation/freezing, and not so much the actual direct freezing of the water. The smallest drops due to wind fragmentation will be 1 to 2mm, still a bit big to freeze in less than a second, and there will be many bigger drops making up the bulk of the water mass. 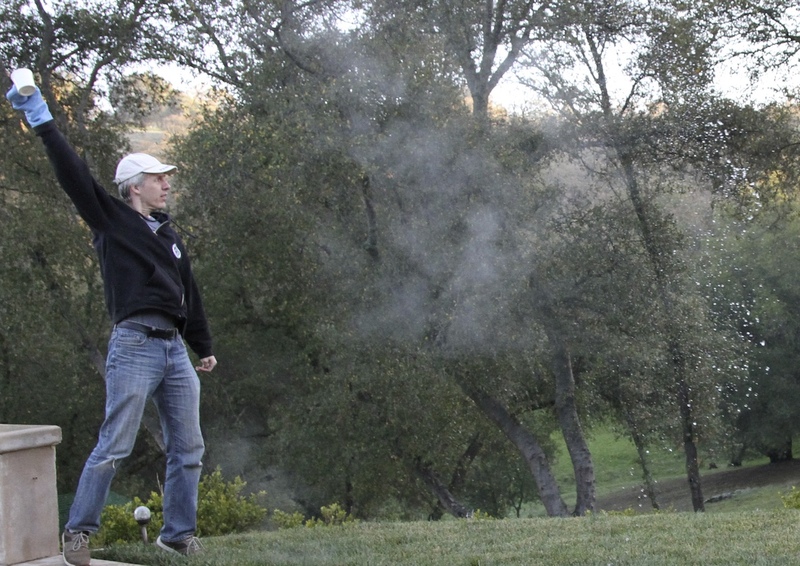 For contrast, I just tried throwing some boiling water into the air here in Southern California. It's what we call "cold" here (60°F/15.5°C) and 32% Relative humidity. There was a small amount of condensation, but it's hardly "see your breath" weather. If it were -40°F, then each droplet of water would leave a trail of (variably) persisting ice fog. Here you can see the drops of hot liquid water trailing streamers of ice fog. Boiling water is close in state to evaporation, when thrown in the air it increases the surface area exposed to freezing cold air (very cold air also has a lower level of moisture..). In my opinion, this is also a good demo to show people who don't in in persistent jet contrails. 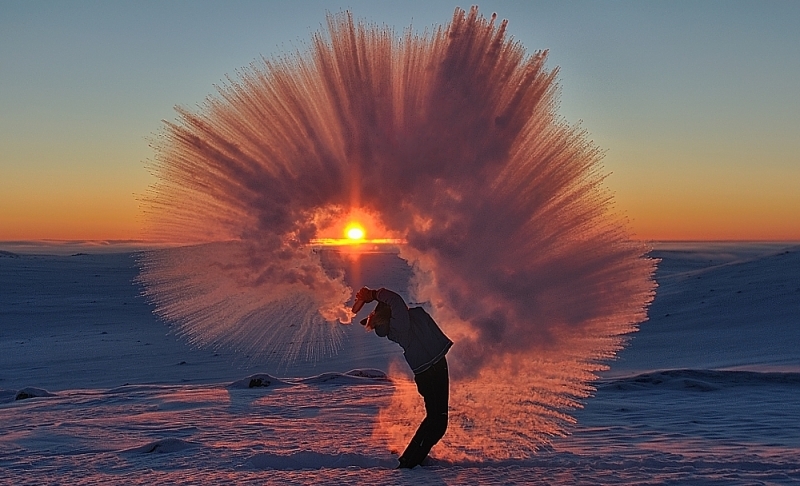 The water pistol clearly leaves persistent clouds of ice crystals. Edited because I don't know how to embed videos on this forum. Edited again because I messed it up worse by trying to fix it. Thanks, Mick. So basically the water itself isn't freezing, it's just the minor amounts of evaporated droplets that are freezing. And this evaporation would occur in normal temperatures as well such as in your 60F toss (actually more of it, but basically negligible amounts; evaporation occurs at higher temperatures). The only difference being that when it's cold enough we see the droplets freeze so we see the evaporation occurring. Kind of, except there's no such thing as "evaporated droplets freezing". The water evaporates first as an invisible gas (water vapor), and then as this hits the cold air a very short distance from the surface it condenses into very very tiny liquid microdrops, these microdrops then freeze. And a cautionary tale, don't play with boiling water! With the media coverage, lots of people are giving it a go, and ending up burned. Shouldn't boiling water turn to snow more often than cold? It is known that hot water freezes faster than cold water. I am not sure if there is a full scientific consensus on why, but my theory is that the heat is creating movement which sets up circulation to move colder water down faster and conduct heat away through the top faster. Perhaps because hot water is already steaming, it will evaporate faster and then condense an become frozen faster? A container of hot water can freeze faster than a container of cold in certain situations. But that's not applicable here, as we are talking about small drops of water. Hot water will certainly evaporate faster, and produce a lot more condensation than cold water, and that's what we are seeing here. The water itself is not freezing, it's the evaporation (the "steam") that is condensing and then freezing. So boiling water will produce more ice fog than cold water. At least the spirit of experimentation is alive. Note I had an oven glove on when I threw mine I'd just read the buzzfeed article. Clearly the trivial fact has been debunked - but is that of any great relevance to most people?? Nope. But it's entertaining, and is a useful illustration of some of the properties of water. Ice fog often comes up in discussion regarding contrails and the chemtrail theory, so I thought it would be good to have a thread on it we could point at for people. Isnt there a drought In California now Mick ? The water police might get you What difference is a persistent contrail compared to this ? A persistent contrail starts out as a pure gas, and not liquid water, but the condensation and freezing is similar. Most of the video examples are too low humidity for the cloud to perist. The primary differences are of scale. A trail coming from a plane is very different from a brief localized cloud. Mostly it's a lot bigger. Several hundred feet wide to start with, and many miles long. When you view that from the ground, what you see is very different from what you see when someone ten feet from you throws a pot of hot water in the air - only a part of it evaporating. You also see a very different effect from convection with the pot of water vs. the wake vortices on the plane, so the general shape and initial motion is very different. So it appears as if its lingering and spreading when actually its falling ? Contrails are basically clouds. So they do what clouds do. Initially though they are caught in the the wake vortex, which sinks, so they end up below the level of the plane. Initially when you see a contrail spread though, it's sinking. So the spread is vertical. If the vertical spread is significant enough then the difference in wind speeds will spread it out a lot more horizontally than vertically. The cup of water cloud will basically act like smoke, and it generally dissipates, because there's not a lot of it. While it's possible it can trigger long lasting ice fog, its likely that you'll already be in fog to start with - as your breath and other things will freeze. What is interesting with this video is that a couple of milimeter thick stream of water can create so much effect. One can imagine what happens when you have a similar effect coming from an engine that is larger than a full grown person. Because when it is one whole pot of boiling water the molecules are moving and hitting each other, creating and retaining the heat, once a part of the water is separated from the main body it will not benefit from the molecules near it, so as one drop energy slows it will become cooler because it does not have anything near it to provide further energy. If you wanted to test it, get several containers of the same size, fill with variable levels of water, boiled, then ensure room temp is steady, and monitor the rate at which the temperature drops. But splitting it up does not make it cooler, it just makes smaller drops, which THEN cool faster. You seemed to be suggesting before that the actual act of splitting into drops actually cooled it down. Sorry what i meant is that it is the splitting that cools it faster by separation from nearby excited molecules and because each drop can release its heat without keeping warmth from the rest of the liquid. So if the room is a fixed temperature and you sprayed boiling water into a bucket at the same time you poured boiling water into a bucket, the sprayed water would be cooler BECAUSE it had been in smaller drops. The thermal energy in the water is proportional to the volume of water, which is proportional to its size. The rate at which it cools is proportional to the surface area of the water, the more water you have, the lower the ratio of surface-area to volume and the longer it will take to cool. So basically being in thousands of drops maximises the surface area to volume ratio, meaning that being in drops will cause faster cooling than not being in drops. Yes, and that would be a factor here over longer time frames, but in the two seconds involved here, it's not really clear if any of the macro drop actually freeze, or if it's just ice fog (or even just regular fog in many online videos, as a lot of the US is not really that cold). How long does it take for a single drop of water to freeze at -40°F? It all boils down to humidity...see what I did there? I notice in the article that you say "I don't think any more water is evaporating than would if it were thrown at normal air temperatures - quite probably less". This could potentially be true depending on the absolute humidity and temperature of the "normal air", but in most real-world humidity scenarios would not be true. At -40 air has very little ability to hold moisture. 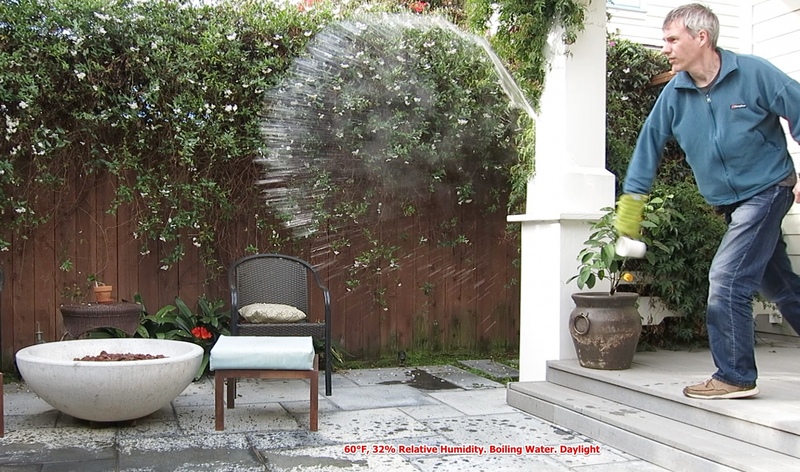 By throwing boiling water into it, the local air temperature around the water droplets increases drastically, in turn increasing the air's ability to hold moisture. The boiling water then rapidly evaporates into water vapor as you have explained. Then as the heat from the boiling water dissipates (almost instantly) the local air cools back to it's starting temperature and can no longer hold the water vapor. 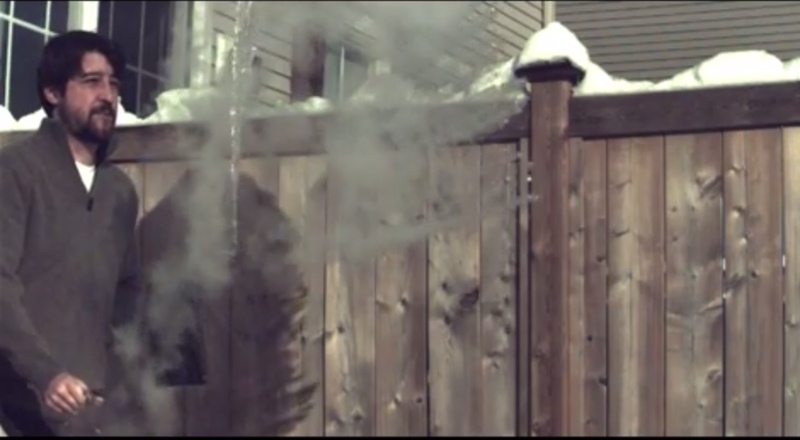 The water vapor is "squeezed" of the air and sublimates into ice crystals (snow). It is the vast difference in humidity that causes the rate of evaporation to be so high. "Normal air" would have a significantly higher humidity to start, so the rate of evaporation would be much lower and you would see far more water hitting the ground then you do in these videos. For our example the surface area (A), wind speed (v) and saturation humidity ratio (xs) will be the constant, so the only variable left is the humidity ratio of the air (x), which has an inverse linear relationship to rate of evaporation (gh), so YES there would be a linear relationship with the humidity of the air and the amount of water hitting the ground. As you can see from the graph below, the lower the temperature, the lower the humidity ratio (x) will typically be. This is why you will see less water hitting the ground and more evaporating at these low temperatures. Obviously I'm getting a lot done at work today. Interesting. There's a complex set of things going on in a very small space near the surface of the water. I wasn't thinking about the change in the ability of the air to hold moisture. It would seem though that as the water itself is near boiling, then that side of things is "pushing" the free molecules out very fast? 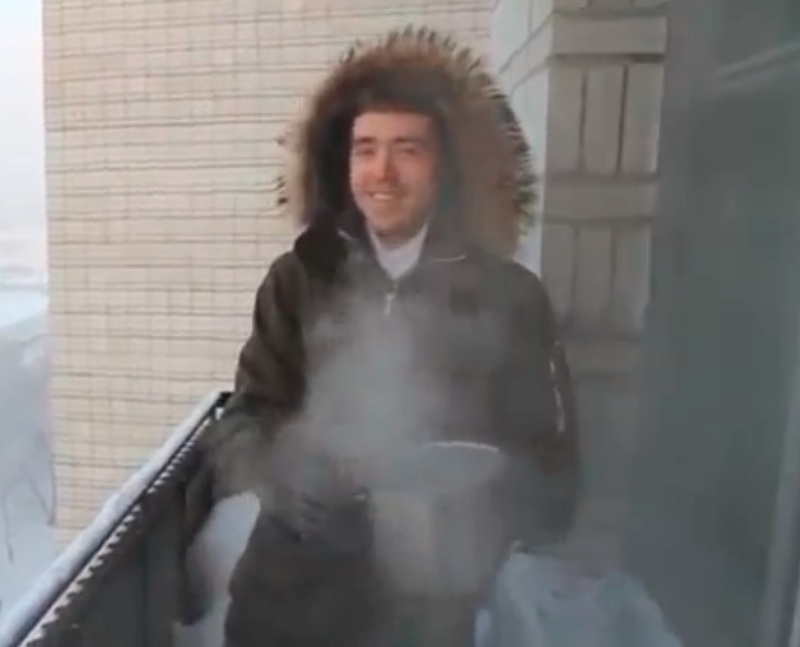 If you boil a pot of water in -40°F air, will it boil off significantly faster than at 70°F? What if you are not boiling it, just keeping it at 210F? Will it evaporate significantly faster? In the situation of the spray of near boiling water, there is a huge surface area, and a comparatively a large aggregated volume for the process to work in. In the boiling pot scenario, you only have the free top surface of the water, and above that is a cloud of steam. Very different. I have to admit, I hadn't given this phenomenon much thought. Matt McLean's explanation is excellent. Thanks, Matt! The hotter the water, the higher xs will be, so the faster the rate of Evaporation for the same environmental conditions, so yes essentially "pushing" the free molecules out faster. If the humidity ratio (sx) of the air at 70°F was the same as the air at -40°F, then the rate of evaporation would be the exact same. Having said that, in an outdoor, real world scenario the air at 70°F would likely have a much higher humidity ratio than the air at -40°F, so the evaporation would be slower in the 70°F air. The same would apply to water at 210°F. Thanks Ross! I was only introduced to this forum today and I am very happy to have found it. I did this boiling water experiment several years ago when I was a student working in frigid Northern Alberta and it bothered me for some time that no one I knew could come up with an explanation for the effect. It wasn't until 2 years later when took a course in Psychrometrics that I was able to make sense of it. Very happy to be able to share the knowledge! If you're boiling the water, the humidity of the air wouldn't be a factor, because at boiling point you don't need air to take up the water, the water vapor itself reaches atmospheric pressure. In that case the heat flux (the Watts from your heating element) you apply determines the evaporation rate. Keeping the water at constant temperature below boiling point, the situation is different: with the humidity ratio at -40°F and at 70°F being equal, the relative humidity will differ a great deal, but indeed that doesn't matter since the air layer close to the water surface will heat up to the temperature of the water in both cases, so it can take the same amount of water vapor. What does matter is the density of the surrounding air: -40° air is denser than 70° air, your hot humid air will rise faster in -40°F conditions, so stronger convection currents, more air flow over the water surface and more water vapor carried away. Aren't there entropic considerations to be made? There's a concentration gradient at the boundary of the water and low humidity air. Also, if the water is evaporating and then freezing before it even touches the ground, why is it that people have burnt themselves trying this, when the water blows back to their skin? If the water can cool to below zero on the time scale in which it hits the ground (indeed, we can visibly observe its cooled state in the air well before it hits the ground), why doesn't it cool similarly to at least a reasonable temperature to not cause burns when it touches the skin? If you simply took a cup of boiling water and poured it from one foot up onto your head then obviously you are going to get burned. There's very little surface area, and it's not in the air for long. If you took that same cup, and sprayed it through an atomizer 100 feet above your head, then it's going to evaporate and/or freeze well before it gets to you. There's a huge amount of surface area, and it's in the air for a long time. That's a spectrum of extremes of the same experiment (and ignoring the variables of air and water temperature). When people get burned, it's because they are closer to the first extreme. They throw boiling water in the air, but not that high, or too slow, or too much water, or it's not that cold, and hence not all the water has evaporated when it falls back down on them. Short answer - not all the water evaporates, so the remaining hot water burns them. This dramatic photo is making the rounds. Again with the misconception that the water is "instantly freezing". Here the hot tea is being expelled from a thermos by spinning it around, rather than the more normal mething of just tossing a cup full in the air. This has imparted more considerable velocity to the individual drops, and you can see actually see each drop is leaving a trail of condensation in its wake. 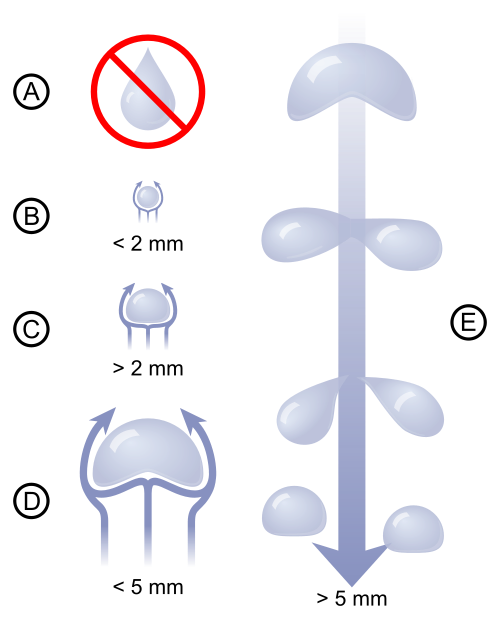 This means that the drops are still liquid. It's not "instantly freezing", there's just a lot of condensation. 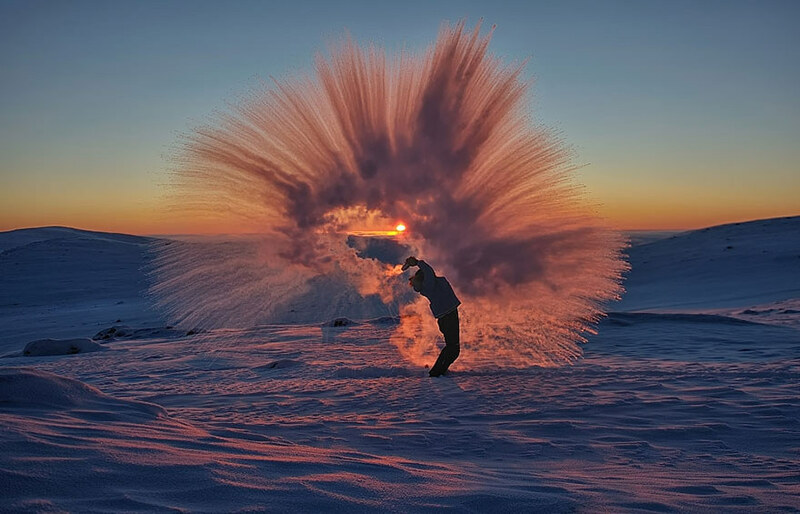 This photo can only be achieved in the coldest of environments. Throwing hot liquids into the air in other circumstances can lead to severe burns and injuries. But their story that they actually link to is of people throwing hot liquids in the air in very similar circumstances. 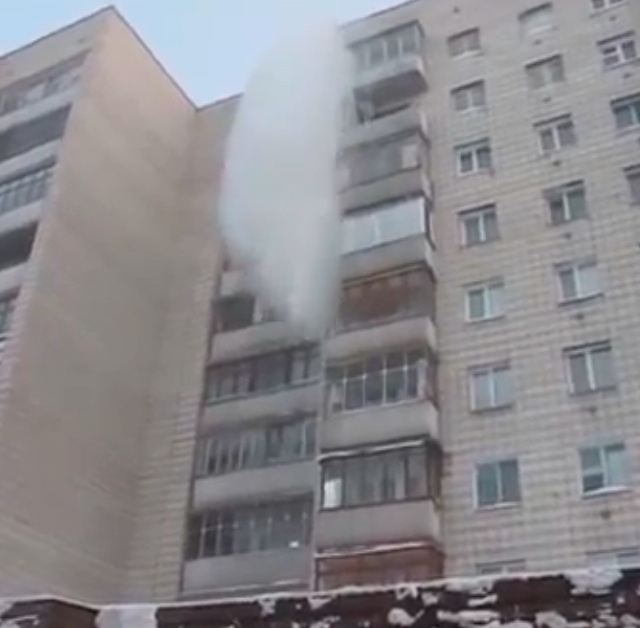 It does not matter if it's -31°F, if you throw boiling water in the air, it does not instantly freeze, and can injure yourself or other people. I was inspired to revisit my non-freezing experiment, in slightly colder weather than I did in Los Angeles. Around 42°F this morning. That's 73°F warmer than the photo above. You can see the drops of water break up as they are flung outwards. They leave a trail of fog, but remain liquid. It's just a lot less dramatic, as it's not so cold. From a safety perspective, the key is to throw the water fast enough (or from high enough) that it breaks up into individual drops that spread out over a wide enough area. I got spattered a little with some drops, but they did not hurt. I was wearing a silicone oven mitt in case I splashed a larger quantity of the boiling water on my hand. "trail of condensation" ? different than a contrail? Isnt a "contrail" by definition frozen? Contrails can by water or ice. Aerodynamic contrails at low altitude are typically water. Engine contrails are typically ice. A container of hot water can freeze faster than a container of cold in certain situations. Is that actually true? It's been a while since I last tried to hunt this one down, but at the time the best I could find were some experiments from an Italian [IIRC] research team that postulated previously unknown states of water and other questionable explanations. Most damning was that no one had yet been able to duplicate the experiment. I recall a conversation on a WAMU talk show where a caller offered his debunking of the claim. A container of boiling water and a container of cold water are placed into a freezer. For the boiling water to freeze faster than the cold, at some point the water in the two containers would necessarily have to be the same temperature. This means the water in the boiling water container would somehow have to 'remember' its earlier condition in order to freeze the fastest. The Mpemba effect, named after Erasto Mpemba, is the observation that, in some circumstances, warmer water can freeze faster than colder water. Although there is evidence of the effect, there is disagreement on exactly what the effect is and under what circumstances it occurs. There have been reports of similar phenomena since ancient times, although with insufficient detail for the claims to be replicated. A number of possible explanations for the effect have been proposed. Further investigations will need to decide on a precise definition of "freezing" and control a vast number of starting parameters in order to confirm or explain the effect. In 2012, the Royal Society of Chemistry held a competition calling for papers offering explanations to the Mpemba effect. More than 22,000 people entered and Erasto Mpemba himself announced Nikola Bregović as the winner, suggesting that convection and supercooling were the reasons for the effect. The statement by J. D. Brownridge, “Hot water will freeze before cooler water only when the cooler water supercools, and then, only if the nucleation temperature of the cooler water is several degrees lower than that of the hot water. Heating water may lower, raise or not change the spontaneous freezing temperature,” summarizes in great part the conclusions that may be drawn from almost all the data I have collected myself and others presented earlier. However, the effect of convection, which enhances the probability of warmer water freezing first should be emphasized in order to express a more complete explanation of the effect. Basically, freezing is not the same as reducing the temperature below zero. Water can exist in supercooled state before it transitions to solid. Heating the water can change the temperature at which this happens, but it varies. Well, I said it had been a while since I looked into this phenomenon. Aside from the evaporation explanation which I agree with. 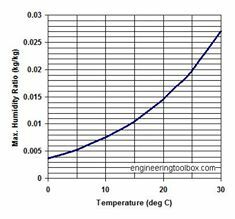 The rate of heat transfer is temperature dependent as well. Hotter liquids cool more quickly and when evaporation and smaller particle size is suddenly introduced it accelerates the process. I believe kurtosis plays a role in why hot water can sometimes freeze before cold water. A vortex tube can demonstrate this with air by separating the faster moving molecules from slower ones. The histogram of the molecular speed distribution I’m sure plays a role but it is a hard thing to measure but maybe a wider speed distribution can be encouraged depending upon convection, stirring, presence of dissolved gasses, surface area to water depth ratio, and the diversity of ionic mineral species present...?